It’s been yet another hot week here in Rhode Island! I tend to prefer the heat to the cold but this is really testing my limits. Luckily, the flowers don’t seem to mind (although they would love a nice rain sometime soon). 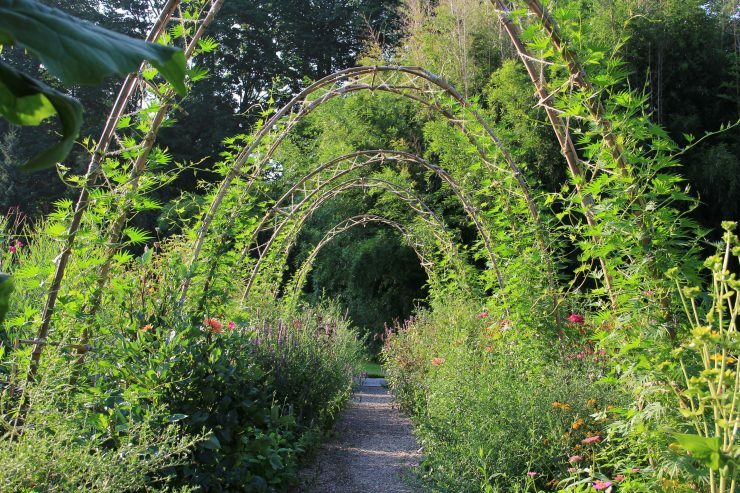 The vines in the featured image (love-in-a-puff and cardinal climber) have been racing for the top of the arches during this long hot season. For some gardeners in New England there has been way too much rain this summer. We aren’t sure if it is the cool air of the bay keeping the rainstorms away from us or simply some odd luck, but, for better or worse, we have not suffered from a wet summer here at Blithewold. Even as I’m grateful for weekends off work to recuperate from all the heat, lately I have noticed that on the weekends I miss the gardens here. There is such a resilient cheerfulness in the abundant blooms across the property. Here are a few of my favorites this week. The burnets always capture my attention in late August/early September. They move elegantly with the breeze and are adored by pollinators. We have a few of the taller great burnet (Sanguisorba officinalis) in the back of the Cutting Garden. They make excellent cut flowers, although it is sometimes hard to part with them as they add such sweet drama to the garden. We pick them sparingly and strategically to ensure their character remains. 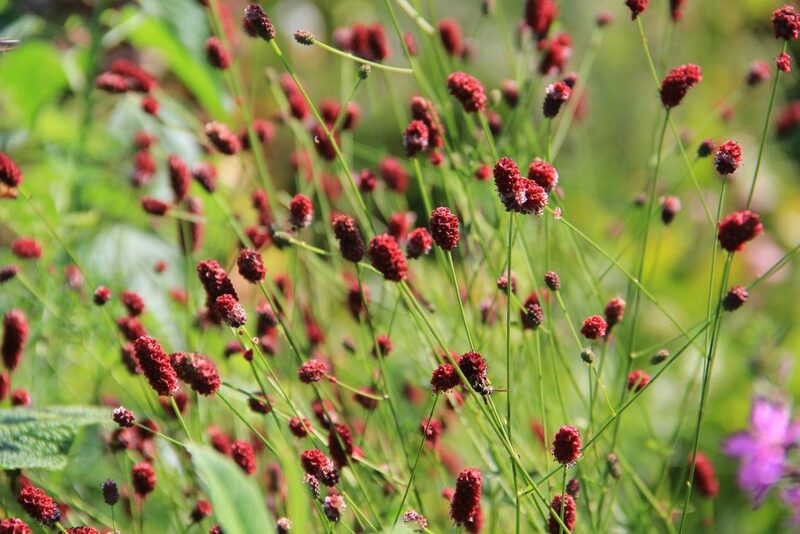 The burnet pictured above is Sanguisorba menziesii, which has the Goldilocks height of just about three feet. Perfect for the middle of the garden. The bees agree. 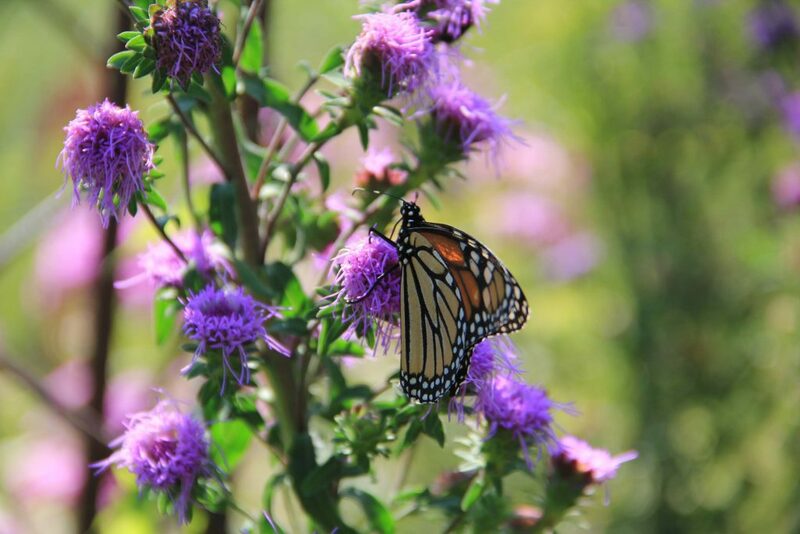 Last year Gail went on a hunt to add more New England native plants to our gardens. One of the beauties she returned with is Northern Blazing Star (Liatris novae-angliae). The plants are now thriving in the Garden of Hope in the Idea Gardens. Their tall spikes are covered in feathery purple flowers that are currently in bloom and being appreciated by bees and butterflies (see above). Northern Blazing Star is “rare and protected in most of New England” according to the New England Wild Flower Society. Gail found this in Wakefield, RI, at Blue Moon Nursery, which specializes in Rhode Island native plants. When the summer heat really begins to drain my spirit, I am often uplifted by our collection of Cosmos. Each year we try different varieties to see if we find a new favorite (we always do!). I am currently enraptured by Cosmos ‘Double Click Bicolor Violet’. It is beginning to bloom in the Cutting Garden and I always have to stop to appreciate these stunning flowers. Cosmos are a classic choice for a cutting garden. They have a light and airy quality that seems to defy the humidity of late August/early September. I will always grow Cosmos for this reason. Speaking of light and airy, this fountain grass is all lightness and movement in the garden. 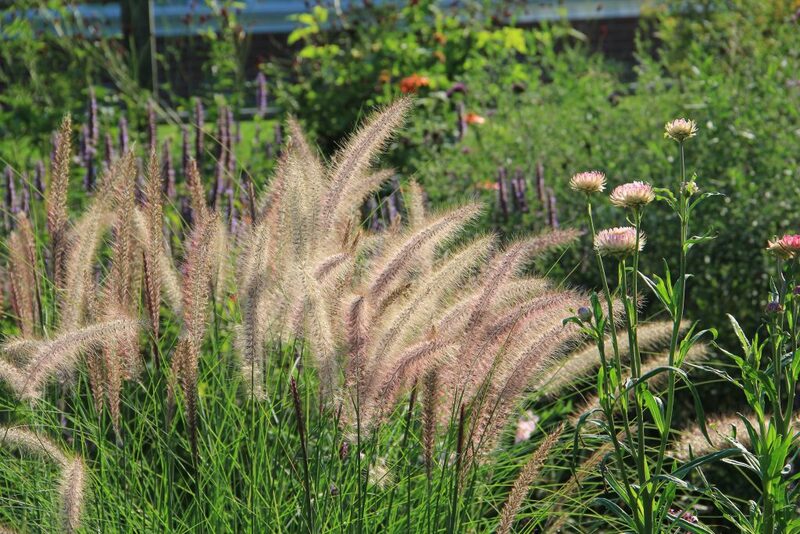 Pennisetum setaceum ‘Beauty of Marrakech’ is a wonderful addition to the late season Cutting Garden. I am often transfixed watching the feathery plumes sway in the breeze. Last but not least is this sweetheart of a plant. This double rudbeckia (Rudbeckia laciniata ‘Golden Glow’) is so tall (6′!) that it leans gently over the fence that guards the back of the Cutting Garden. 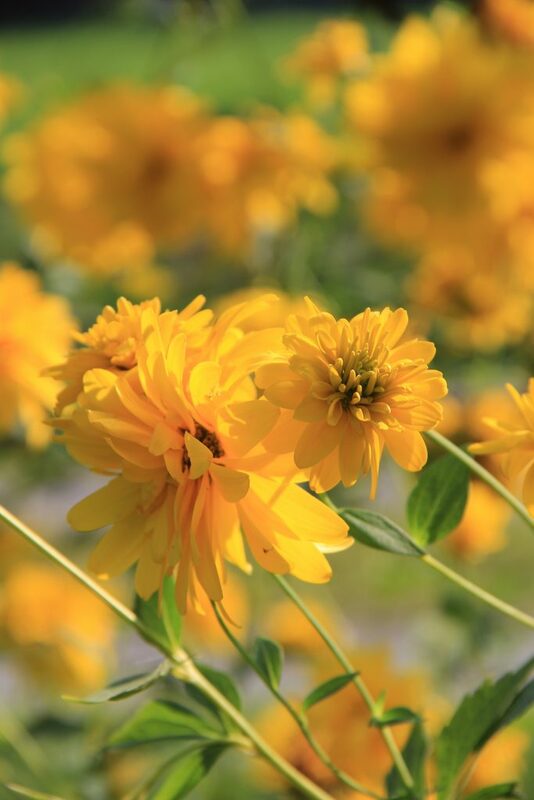 It is aptly named as its flowers truly do seem to glow in the garden. 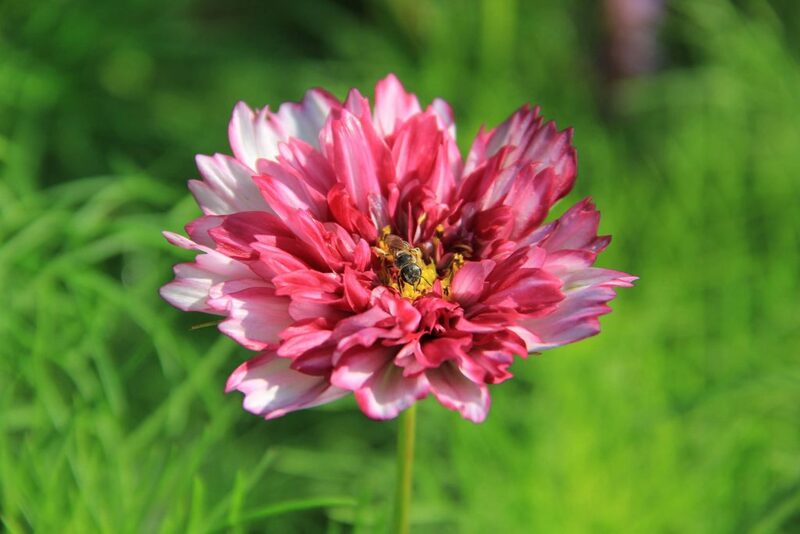 It is often abuzz with bumblebees eager to grab all the nectar they can from these blooms. I hope that if you are feeling any late summer doldrums that you will find your way to Blithewold. A walk in the gardens here is sure to lift the spirit and inspire the mind.